Toss the Typewriter | Appreciate the past; Live the present; Anticipate the future. “Go to King’s Church later,” my instructor suggests. “The Wren Library is only open until two.” With one last look at Cambridge’s Gothic church, which I’d been assigned to write about, I joined the group headed down a cobblestone street. I could always go to Evensong later and gather material for my post. I was happy to join this group, because I hadn’t wanted to miss the Wren Library at Cambridge, and it would have been hard to find on my own. Our instructor led us to the entrance. We were told to turn off our phones. Only 15 people can tour the library at a time, but luckily there was room for our group of five. The others headed up one floor to the main room. I paused halfway up the first staircase, already enchanted by a concave doorway with its doorknob set in its tea-green center. It reminded me of simpler times when doors were carved by hand, and if opened, a friendly yellow bear greeted you with warm bread and honey. My first experience with A. A. Milne’s writing was not the red “House at Pooh Corner” book my sister gave me when I was seven. Rather, it was the poem “Halfway Down”. In it a boy sits on a step and ponders where he is and where he isn’t. I learned later that the boy was Christopher Robin, friend of Pooh. This poem was part of the reason I love my home. It has old wooden steps that stop midway up to split in two directions. Slowed by the interesting door, I gazed at the molding, the windows, and admired a marble bust of Alfred Lord Tennyson. At the entryway to the library, I gazed down the narrow hall at the far-off stained glass depicting Sir Isaac Newton’s presentation to King George III, circa 1990. Along each side of the room are alcoves of books and covered display cases. The Wren Library, designed by Christopher Wren in 1676, and completed in 1695, houses 1,250 medieval manuscripts, 750 incunabula, and a growing collection of modern works. Some of my favorites were Charles Darwin’s “Origins of the Species”, with geologist Adam Sedwick’s dissenting notes in the margins, myriad hand-lettered Bibles, some with their ornate designs snipped out, an intriguing mathematical design from philosopher Ludwig Wittgenstein’s notes, Shakespeare, Milton, and of course, toward the end, Milne’s “House at Pooh Corner”, its prose elegant in its simplicity. I never made it to King’s Church. It was closed by the time I arrived at the gate, and the students were still on holiday, so there was no Evensong. Still I’m grateful to have chosen the path I did. It had seemed like a good idea at the time, so I coaxed two of my classmates, Erin and Nicole, into joining me for dinner and writing at a local pub. We packed our pens, notebooks, and laptops and walked the half-mile from our hostel to Kensington’s Stanhope Arms. “I do this at home—meet up with friends to write,” I told them. I’m sure I also mentioned working over dinner at Applebee’s Neighborhood Grill while my daughter was at soccer practice or writing at Crackskulls coffee shop in Newmarket. I think I was feeling a bit nostalgic. I’d been in London for several days now, traveling with a group of twenty-something women. One would mention an incident on the Tube and I’d be reminded of the man in a Brooklyn subway who sniffed my daughter’s hair. Another spoke of skiing and I thought of our family’s last ski vacation in Maine. It wasn’t homesickness that drew me to the pub. Rather it was wanting to create a new memory based on old material. We pushed open the glass doors of the 1845 building. It took only a second for our eyes to adjust to the inside lights. Although molding was dark wood, the Victorian walls and ceiling were painted in brighter whites and yellows. Most of the tables were filled but we found three tall chairs at the far side of the bar. There was plenty of room for our laptops and for our dinners. This was exactly the experience I was seeking. Voices drifted around us, there was the scent of old beer and good food, and the wait staff was friendly and attentive. On a large screen television behind us a football game was being played. I was surprised that the guests ignored the game—I’d thought British fans would be more engaged. I ordered the Beef and Red Wine pie with mashed potatoes, and a Guinness, in honor of a family trip to Ireland. Several minutes after my friends received their drinks, my stout arrived, its two-part-pour foam floating above the glass’s golden harp. I watched the game while I tugged my laptop from my backpack. The men were playing on a small field. “The field’s odd,” I said. “I think it’s a video game,” Erin said. I glanced around the room. There was no sign of anybody playing the game, but she was right. I felt deflated, as though my experience had been stripped of its authenticity. By the time my pie arrived, a real game was on the television. The bar had become livelier, making it difficult to chat with Nicole and Erin. I watched the game while we ate. The pastry was crisp, and light and the tender beef filling was flavored with sweet onion and hearty mushrooms. Buttery mashed potatoes, flattened to a half-inch with a grid, were my favorite part of the meal. When we finished, we considered writing, but the fans had become loud. We were ready to move on. The experience here was different from home, but it was exactly what I’d needed to satiate my hunger. After I had trudged up five floors, Lauren, a docent in the Ceramics exhibit at the Victoria and Albert Museum in London, pointed me toward the furniture room. There I found a “Chair Bench”, designed by Gitta Gschwendtner. The light-colored ash bench, made by the Sitting Firm Chairmakers in Coventry, sported six chair backs and legs each having its own unique design. According to the placard, the designer found historic chairs in the gallery, each made from different woods with different artistic techniques, and installed them onto a flat, horseshoe-shaped bench. The legs of the bench were from the same antique chairs but were mismatched with the backs. There was a captain’s chairback with armrests, a chair you might find at a French café, and another that might have been from a formal dining room. One was was straight-backed and tall, another short and rectangular, and the last was an ornately carved decorative chair. I decided to find the originals and when two were difficult to locate, I engaged Kate, the exhibit’s docent to help me. Afterwards she and I sat on the bench and discussed what we’d found. She sat in the Captains’ chair with a heater at her feet and said it was the most comfortable of the chairs. I sat across from her in the rectangular chair. The uncomfortable ornate chair is from 1560’s Italy, made from walnut, and was worked on by at least two artists, one from the 16th century and one from the 19th. The 2011 factory-made rectangular chair, designed by Industrial Facility was made from ash, and assembled using dowels. It was a comfortable chair. Next was Frank Lloyd Wright’s rigid tall-backed chair, made of stained oak. Geometric regularity was his signature architectural style. This chairback promoted excellent posture, which isn’t necessarily comfortable. The café chairback from the Thonet Brothers (1859), was designed in Vienna, and used steam-bent solid beechwood to create the delicate curved support. The formal dining chair was created around 1725 in England and was carved from walnut. The seat I called a captain’s chair is a Windsor armchair from 1830. Thomas Simpson used steam-bent yew for the back and the legs were carved from ash. Since I was exhausted from all my London touring, and the gallery was quiet, Kate and I relaxed on the bench and discussed the furniture around us, her future as a portrait painter, and she suggested I visit Strawberry Hill House and Garden in Twickenham, where I’d enjoy the Gothic architecture and Horace Walpole’s curiosities from the 1700’s. It seems there’s no rest for the weary in London’s fascinating neighborhoods. By the time I cleared customs at Heathrow Airport it was 7:30 AM. 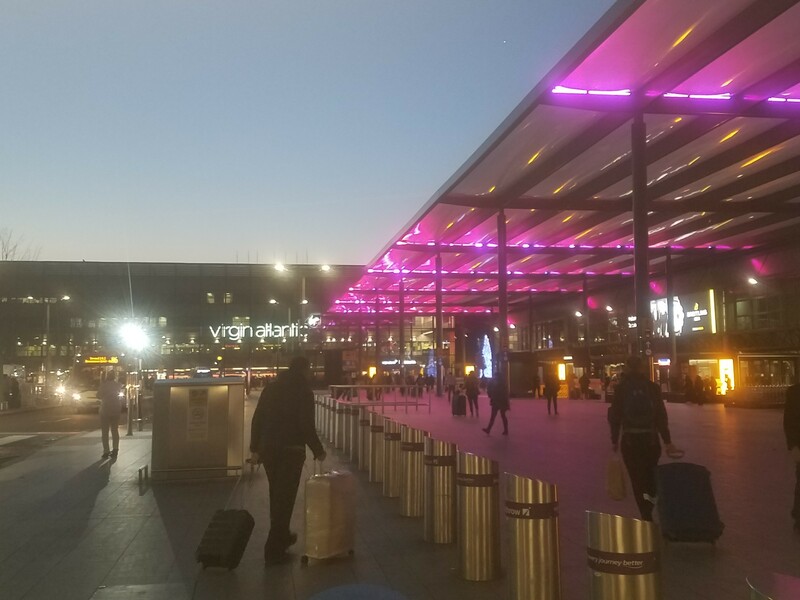 I strode outdoors with other travelers and headed toward the glaring Virgin Atlantic sign, where I hoped to find the Tube. Dawn’s breeze, mostly fresh with a hint of vehicle exhaust, brushed my face. Fuchsia lights lit the outdoor ceiling. Before leaving for London, my husband and I discussed the length of days in January compared with our New Hampshire home. We learned that the sun would rise at approximately 8:00 a.m. in both locations, but evening would come more than an hour earlier in the United Kingdom, ending my daylight adventures at approximately 4:15 p.m. Since I’d be in class until 11:30 a.m. daily, I’d have less than five daylight hours to see the city. After that, the Gothic, Regency, Victorian, and Edwardian architecture would be hidden until the next day. As it turns out, I needn’t have worried. London is a city of lights. From the time the sun slips behind the last buildings, until its morning rays brush the spiky bulbous tops of London planetrees, street lamps light sidewalks and recessed lighting brightens stairs. The London Eye’s bulbs creates a red Coca-Cola circle around far-off buildings. Below the Eye, the London Aquarium’s Edwardian baroque architecture is softened by aqua uplights. 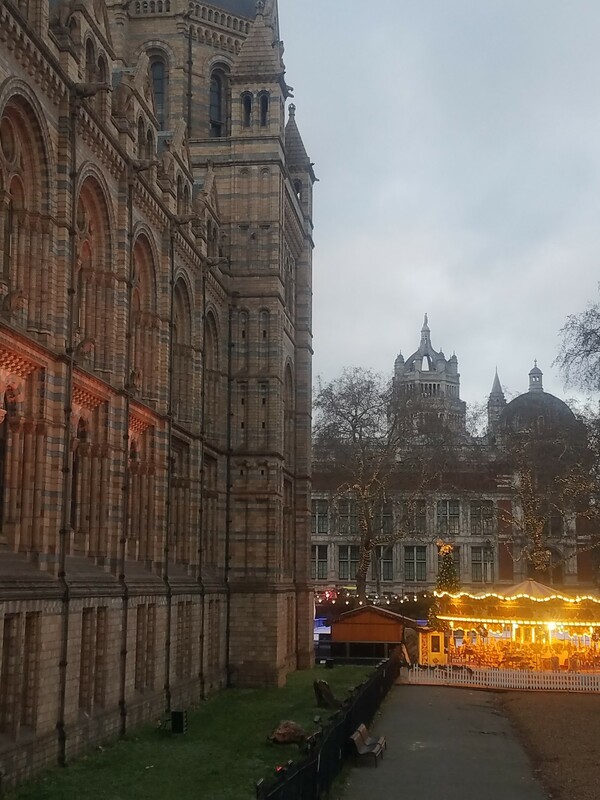 Across town, the Romanesque Natural History Museum glows pink, gold, and blue in subtle white lights, while its merry-go-round is a jeweled crown, golden in the night. Each display was carefully planned by lighting experts, who complemented the texture, materials and style of the building with their displays. Most likely they took into account the impact the outside lights would have upon people entering, exiting or working within. According to lightingstyles.co.uk, misplaced uplights can create glare and light pollution. Last night, after enjoying Everybody’s Talking About Jamie, I strolled under brightly-lit marquees from the Apollo Theatre to the Piccadilly Circus station, thinking about the impact of night-lighting on our environment. Research conducted by the Natural History Museum in conjunction with UNESCO found that since the early 1990’s light visible from space has decreased by 28%. Yet since then, there’s been a 39% increase in dimly lit areas. Insects don’t breed as efficiently, which leads to less food for birds and bats. Birds, which mostly hunt by day, have increased hours for seeking food, but interrupted sleep patterns. Bats, which hunt by night to avoid most of their avian predators, have fewer unlit locations available, endangering their survival. I turned slowly on the London sidewalk, taking in the colors and flashing lights and bright marquees. Some were garish. Some were beautiful. I thought about my home and how I can step outside, look up, and see hundreds of stars beyond our white pines. Then our dogs will trip a sensor, washing the backyard in cold white light. I make a mental note to rethink our own outdoor lights, perhaps shortening their on-time, changing to warm colors, which are better for wildlife, and redirecting the lights away from the woods. I turn from the city lights, and move with the crowd into the bright white Piccadilly Circus station. When I stepped from the London Underground’s platform into the District of Kew, I knew I’d made the right choice to spurn museums for the outdoors. Blue sky was brush-stroked with clouds, the city’s noontime bustle was behind me, and the Kew Royal Botanic Garden lay ahead. I’d arrived in time for one o’clock tea, so I relaxed at The Botanical to sketch out my must-see sites. I sipped peppermint tea and savored two seared scallops with arugula, and caramelised onion and pea purées. Each taste painted my palete bitter, salty, and sweet, layering until forming a complete composition. 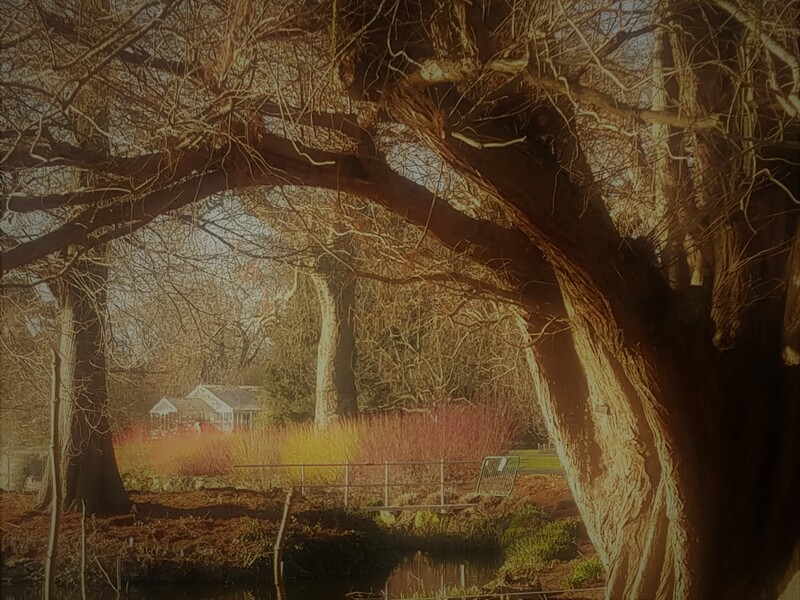 Still, I finished my meal quickly, wanting to explore the fire-bright wood garden just beyond the pond; wanting to see Wolfgang Buttress’s The Hive, an artistic exploration of our honeybees. I wandered slowly, snapping photographs. The fresh air mixed with the fragrant maple scent of flowering Escallonia illinita, native to South America. I explored the geometric metal hive from below and climbed to the top to watch the lights flicker off and on, mimicking a hive’s complex communication system. From the top of the structure I noticed the trees and gardens were swarming with workers. I worked my way down and asked a groundskeeper about the activity. “Some crews are removing the Christmas decorations, but our responsibility is cleaning the bulb beds, to get them ready for the spring,” answered Maija, tugging dried fronts from the ground. For each question I asked, Maija responded with one of her own. Soon she discovered I was taking a travel writing class and that I was supposed to be a museum today, but didn’t want to leave. I’m constantly taking photos of insects, plants, and flowers. Maija saw I was eager to learn about North, who at mid-life was bold enough to travel a male-dominated world to explore her passion for nature. The groundskeeper warned me the gallery would close early. As I hurried away, I watched people leave the pavement and walk through the grass, shortening the distance to their destinations. I followed. 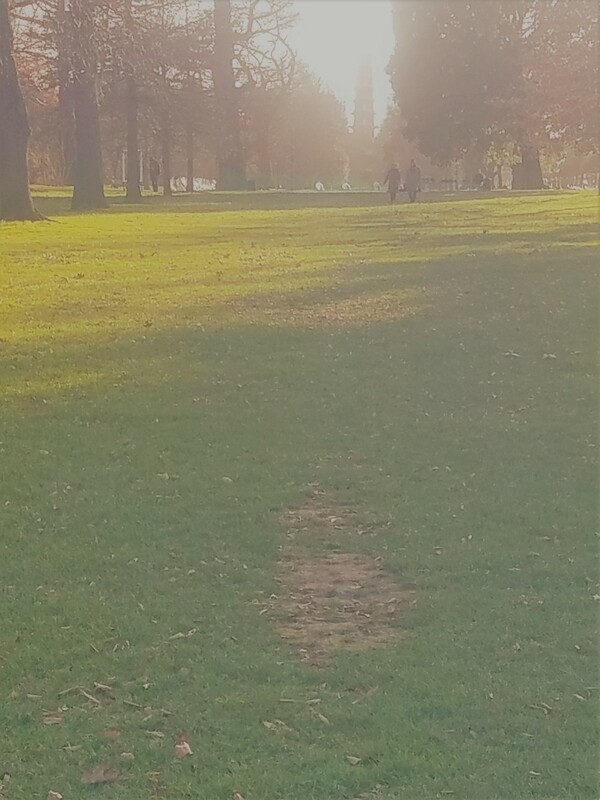 The grass in front of me was worn creating a “desire path”. These are paths that people choose to follow, flouting prescribed routes. It seemed fitting that Kew Garden, keeper of the plucky North’s collection did not discourage these off-road jaunts. I pushed open the door of the Marianne North Gallery revealing two small wood-paneled rooms with tile floors of geometric russet, black and tan. Oil paintings were in floor-to-ceiling columns, wall-to-wall rows, orderly and efficient, color and composition, insects, birds, mountains, and flora. There was Niagara Falls, not yet dominated by high-rise buildings and neon lights. There was Hindu jasmine, South African water lilies, and Java’s slender walking stick. There were hundreds of paintings, each placed by North, herself. The bottom foot of the walls was paneled with wood she’d carried back from far-off countries. I asked Rosemary, a gallery volunteer if people often return. “Again and again,” she said. “I’ve worked here two years, and I still find paintings I haven’t seen.” Marianne North had minimal training. She only began painting after her father’s death. I left Kew Royal Botanic Garden, pleased to have discovered Marianne North, that audacious forty year-old artist, who dared to create her own path of desire.